How does Mastodon solve this issue? Well, Mastodon doesn't have retweets; it has "boosts". Boosts are essentially like retweets, with one key difference: there's no option to add your own commentary. You simply can't post something awful with a message saying how awful it is—all you can do is boost something awful without commentary. What's more, the name itself—"boost"—draws attention to a fact that Twitter does its best to obscure: by boosting something you disagree with, you're ultimately giving that viewpoint more exposure, not less. As a result, Mastodon users basically never boost toots to say how wrong they are, and there isn't an issue with armies of followers descending on the original author. With Twitter, everyone belongs to a single, global Twitter, with a single set of moderation policies spanning every group individual on the service. If you get banned from Twitter, you're banned from all of Twitter. With Mastodon, you don't really join Mastodon itself. Instead, you join a particular server (called an "instance"). Your instance might have a few hundred people and a moderator or two—just the right scale to keep the discussion civil without degenerating into bureaucratic rules-lawyering. And, because you get a "local" feed of all posts on your instance in addition to posts from people you follow, your instance really can start to feel like a community. Finally, with instances, you keep control: if you find that you don't like the moderation policies or culture of a particular instance, you're always free to pick up and move to a different one. This neatly solves Twitter's huge problem with moderation—as Mastodon grows, the number of mods will inherently scale with that growth. Yet, even as their number grows, they'll stay part of (and accountable to) a relatively small community on their home instance. Of course, Mastodon would be pretty useless if it only let you talk to a few hundred people, so it doesn't impose that limit at all. You can follow anyone, regardless of what instance they call home. The only difference is that if you have a problem with them, then you'd complain to their instance's moderators rather than to your own. So what stops people from setting up instances that allow for any sort of awful content and then pestering the rest of us? Well, they can, but Mastodon lets you or your moderators decide to block entire instances. If a particular instance won't mind its own users, then it will likely find that few other instances want anything to do with it—or at least that it's limited to equally laissez-faire instances. Mastodon's user interface provides the very prominent option to hide a portion of a post behind a screen that is only removed when and if the user chooses. This is a great format for hiding the punchline in jokes or concealing spoilers. More importantly, it's also commonly used to hide controversial posts—including posts about politics. What this comes down to is control. This pattern of tagging politics and letting the reader decide whether they want to engage with them puts the reader back in control; they can chose to engage with politics—and many do! But if they don't want to (or don't want to right now), they also have the option not to view those posts. And that's not the only way the Mastodon UI puts the reader back in control; for example, it also has very powerful options for hiding toots based on keywords to give you a middle ground between unfollowing someone and seeing every toot they ever make. Now, I acknowledge that some of this is just a cultural practice; having political toots hidden is dependent on Mastodon users recognizing how corrosive political discussions can be and opting to give their readers control over when and if they see those toots. But it's a cultural practice that the technology nudges people towards with good user-interface design, and it's a cultural practice that, at this point, is firmly established. Twitter is a business that makes money (… er, tries to make money) by selling ads. To maximize ad revenue, they want to keep you on Twitter for as long as they possibly can, which means making sure their content is as engaging as possible. But often, tweets are at their most engaging when they're at their most enraging. Any tweet that keeps people clicking and talking—even if they're talking about how awful the other side is—is a tweet that keeps people around to view ads. Outrage is good for Twitter's bottom line. And that's why Twitter isn't—and will never be—as healthy a community as Mastodon is. Mastodon's innovations aren't technologically that challenging (I mean, a lot of the tech is pretty cool, but it's nothing Twitter couldn't copy if they really wanted to). No, the reason that Mastodon has all these advantages is that they aren't advantages from Twitter's perspective. From Twitter's perspective, anything that makes people less likely to angrily retweet a rival's obnoxious view is a loss, pure and simple. And Twitter doesn't have any choice in the matter, either. Even if they wanted to sacrifice their ad revenues out of a desire to improve the quality of public discourse, they couldn't. Twitter is a public company, funded by investor money; they thus owe a legal duty to make as much money for their investors as they can. Twitter can't, and won't, stop prioritizing ad revenue. Mastodon, on the other hand, isn't profit motivated and never will be. At the top, Mastodon is a small, open-source project funded on Patreon. 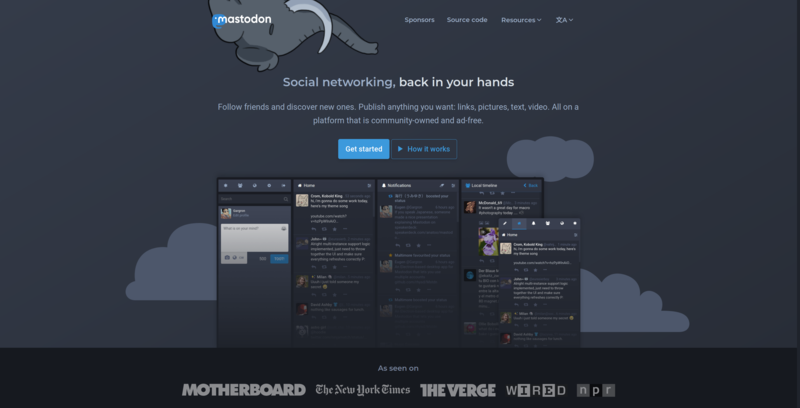 Mastodon can afford to stay small, because it's not trying to be centralized—the vast bulk of the work is being done by thousands of small sys-admins across the globe running small instances of a few dozen or a few hundred users. And that part is sustainable too—running a small instance costs only a few dollars a month, and is a rewarding gig: it comes with a lot of control, and a privileged position to help craft a healthy community. Mastodon's entire model gets its incentives right. If this sounds at all appealing to you, I encourage you to check out Mastodon. It's not perfect, and it might not fully replace Twitter if you're a heavy user—if for no other reason than that people you like to follow won't (yet) have switched. But the community is really great, and growing quickly. And I've had a blast with it since I got involved. If you'd like to join, the main website, joinmastodon.org, is full of good info. You certainly don't need to understand the details of how Mastodon works, but if you would like a bit better understanding of how Mastodon works under the hood, Mastodon user @kev wrote an excellent guide to Mastodon. And, when you're ready to pick an instance, there's a great tool that lets you search available instances at instances.social. My recommendation is to use that tool to find a few relatively small instances with names that sound interesting to you. Then, click through and read about the culture and moderation policies of each instance and maybe scan through the public posts to get a sense of the local vibe. And then dive right in—you can always change your mind later. On a personal note, if you happen to be interested in FOSS (Free and Open Source Software), then I can personally vouch for the community at fosstodon.org. And, on an even more personal note, whatever instance you join, please feel free to look me up. I'm @codesections@fosstodon.org and would love for you to say hi.